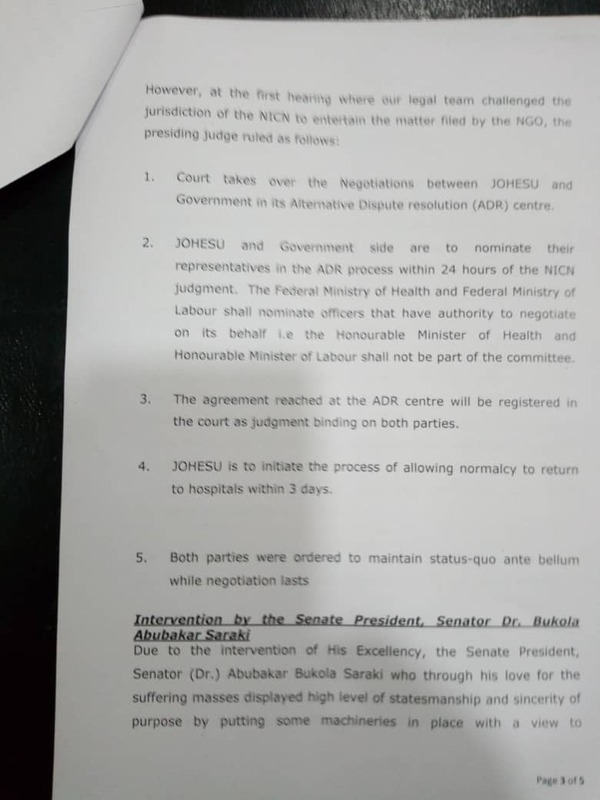 Members of the Joint Health Workers Union, JOHESU, have been asked to return to work on Monday after a series of “promising” talks with the Senate President, Bukola Saraki and their national leaders. 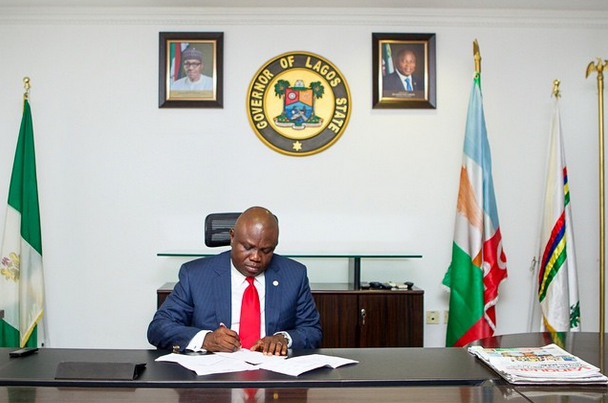 Further to that meeting, the leaders of JOHESU gathered today to make a decision on their strike action which began on April 18. The industrial action which has gone on for more than 40 days is to end this month. 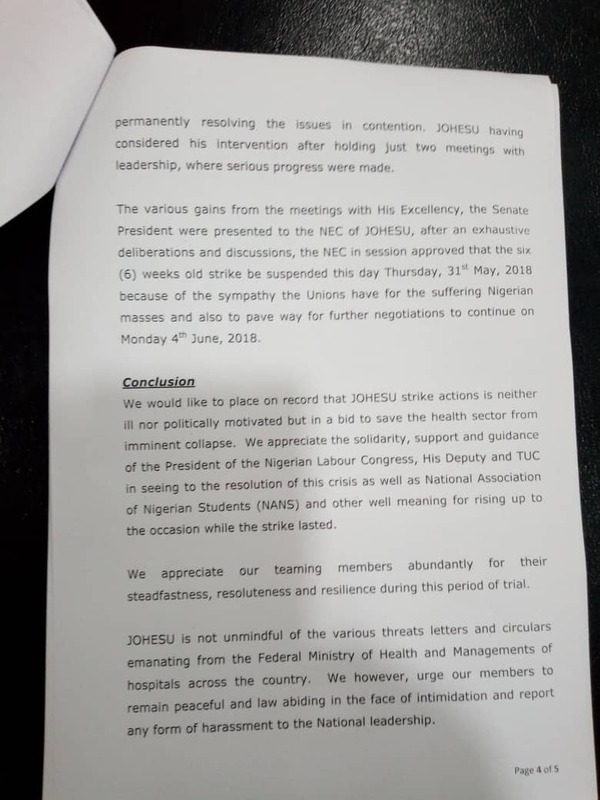 The decision to end the prolonged strike action was made at the end of the national executive council meeting of JOHESU and Assembly of Healthcare Professional Associations, AHPA in Abuja. “The various gains from the meetings with the Senate President, Bukola Saraki, were presented to the NEC of JOHESU, after exhaustive deliberations and discussions, the NEC in session approved that the six-week old strike be suspended this day Thursday, May 31, 2018 because of the sympathy the unions have for the suffering Nigerian masses,” a statement to the press reads. The communiqué released praised Senator Saraki for negotiating the end of the prolonged strike action. Further negotiations are to continue on Monday, June 4, 2018. I am delighted that JOHESU has suspended its strike. Now, our hospitals will once again be open. We must continue with the constant engagement and negotiations to ensure that our healthcare facilities remain accessible for all Nigerians. But, even after holding the “promising” discussion with the lawmaker, President Muhammadu Buhari remained mute about the whole situation. There were reports of plans to fire all those involved in the industrial action. The President of Nigeria has been heavily criticised for staying mute on the matter. Critics believe the 75-year-old who recently returned on a medical trip to the United Kingdom is not bothered about the concerns of the average Nigerian.